The Full Wolf Moon is almost here. It’s the first full moon of 2019, which makes this an auspicious time to focus on what you want to manifest and create for yourself as we settle into a fresh year. And the symbol of the wolf? It’s a clue to us as women, reminding us that we’ll do that creating and manifesting best if we do it with the support of others like us. What is your soul howling for? Are you yearning to create a baby in 2019? Right now is your perfect opportunity to sow the seeds for the ultimate new beginning: conception. Are you working towards manifesting your heart’s desire for your relationship, your creative dream, your business or career? I want to guide you to plant the seeds of your intentions under the powerful glow of the Full Wolf Moon. Or maybe you’re longing for something you can’t quite name. You have a powerful opportunity to clarify intentions for what you want to create in the New Year. The darkness and harsh realities of the winter months are not meant to be faced alone. Just like the wolf, we operate best as part of a pack. The wolf teaches us that we thrive most when we collaborate within the systems that lift us and support us, be it community, family, work, or spirit. As the wolf energy fills the skies, this is the time to seek the support we need all around us to not only survive but to thrive. 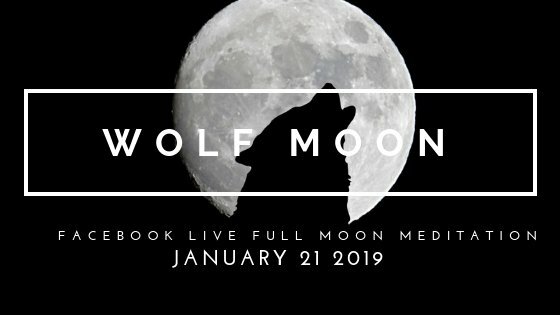 Join up with your wolf pack on January 21!